And now for something different. 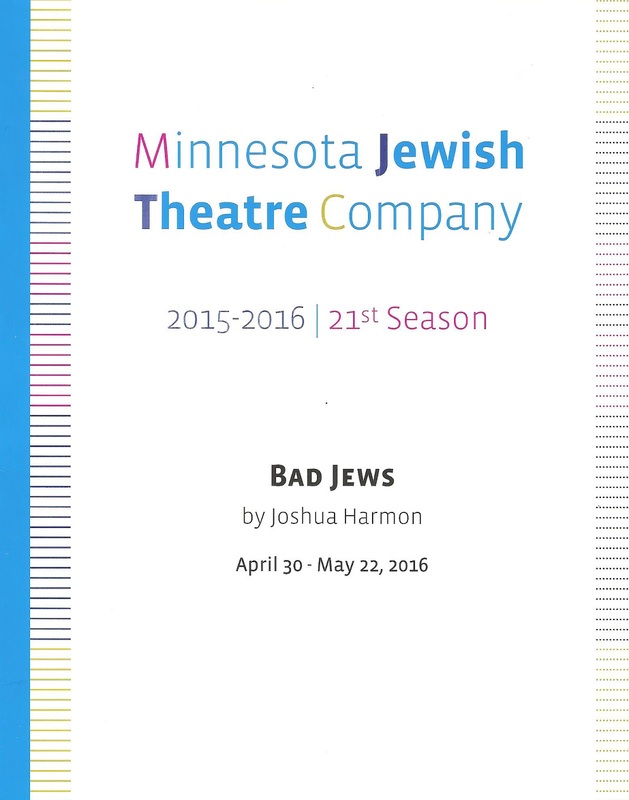 I attended MJTC's Bad Jews on the same night as Minnesota Theater Love's three bloggers Carly, Jules, and KRL, and we went out afterwards to discuss the show and theater in general. This is a show you'll want to talk about, and since the play is four people talking at and with each other, we decided to do a four-way... review of Bad Jews. What follows is our (mostly) unedited conversation. OK, let's get into it. Who did you side with in the big argument? Did you want Daphna (Miriam Schwartz) or Liam (Michael Hanna) to get Poppy's Chai? I found myself taking both sides in various points of the argument. They both make valid points and it's not an easy thing, the balance between the old ways and the new (tradition!). Also, they're both jerks and say horribly offensive things! I was kind of hoping sweet Jonah (Michael Torsch) would get it. At the end of the show though... Daphna came across as being as much of a user as Liam. That makes me rethink my view of the whole show. Carol - I felt some of that even with Daphna and Jonah... except he is gay. Yeah, but am I right? They were practically all over each other! And to my mind, I didn't see a realistic relationship between Liam and his gf, Melody (Adelin Phelps). Carol - you are always right. :) And I agree - Liam and Melody are not a great match. She seems like a choice made just to piss off Daphna and/or the family. Michael Torsch has such amazing reactions! It was fascinating to watch him watch the action... so much happening with that face and body language of his. Yeah... not great audience behavior. I think the only musical I've seen there is Last Five Years. It was a bit awkward having the two guys and the playing space by the door so close to the stairs and audience. And I don't think it was used consistently - the space I mean. The boys head down the hallway to the parents apt, and I believe that is how Liam and Melody enter... yet when they left they left going around back of the set. So - sightlines were a bit tough because when Daphna reached into the cupboard for a glass, I could see that it was empty. So... it can be a bit tricky. I have a feeling the fridge was empty as well but no one could see it. End comment: It kept me involved, I was amused and it gave food for thought. Great cast, good solid direction (especially with all those speeches... never static), and I look forward to seeing more work there. So there you have it! 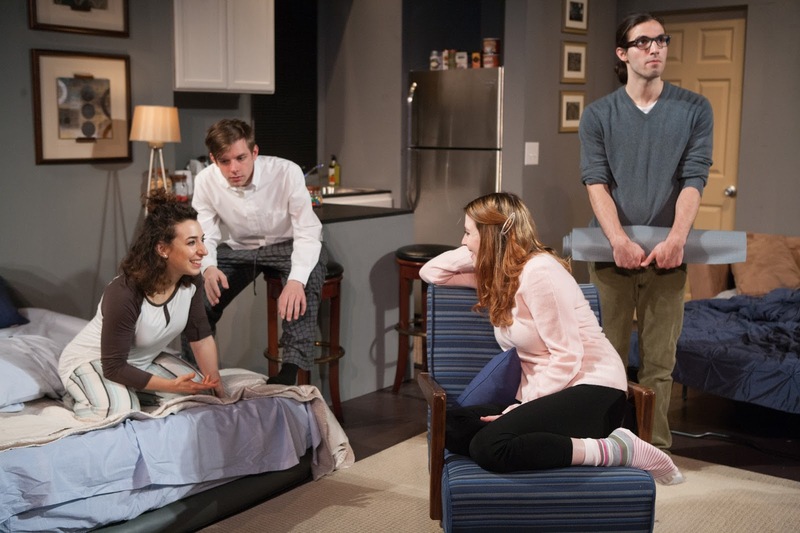 Four theater bloggers discussing a smart, funny, infuriating, thought-provoking, moving play. 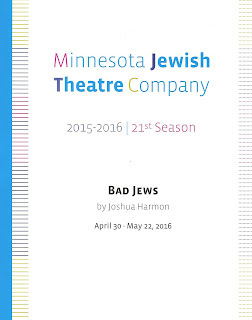 Go see Bad Jews (playing through May 22) and discuss with your friends and fellow theater goers. Thanks to Minnesota Theater Love for letting me join your group. I mostly go the theater by myself and I enjoy it, but it's fun to go with friends too and have a great discussion afterwards. And special thanks to Carly for editing our conversation. Check out more of Minnesota Theater Love's theater thoughts here.